« Oliver Fein, M.D. on the Need for Single-Payer National Health Insurance in the U.S.
Dr. Caldicott to talk about the nuclear “renaissance” in the United States, including the push for the flawed Generation IV reactors. Energy companies have recently submitted applications to build 23 new nuclear power plants in the South alone (including Texas). For 30 years, NIRS has been the national information and networking center for citizens concerned about nuclear power, radioactive waste, radiation and sustainable energy issues. 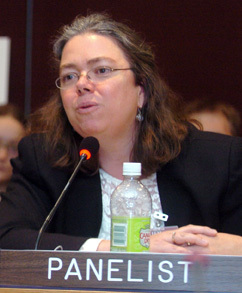 Olson has spoken at the United Nations on nuclear power and climate three times. In this interview, she explains how she continues to educate people about the risks of nuclear power, and recounts her own experience with radiation poisoning. Dr. Caldicott’s book Nuclear Madness: What You Can Do, Olson says, guided her to understand the nature of radiation and find resources for her own recovery. Olson and Dr. Caldicott discuss many vitally important aspects of nuclear power in this episode. Ninety-five percent of the radioactivity that is a danger to the planet comes from making electricity, Olson reports, with nuclear power plants putting off the equivalent of six atomic bombs’ worth of heat a day, around the clock. Globally, the dispersal of radioactive elements means these elements continue to increase their concentrations in all the seeds that form the chain of life, including crops for food. Olson points to the late Dr. John Gofman’s contention that 3 to 5 million fatal cancers may result from the Chernobyl accident. Olson speaks about the nuclear industry’s deception or “nukespeak” about various types of reactors, including their present advocacy of supposedly safer breeder reactors cooled by liquid sodium, which if built would in fact create even more dangerous radiation (and potential for cancer) than existing reactors cooled by water. She refers to John G. Fuller’s book We Almost Lost Detroit about the partial-fuel meltdown of the Fermi 1 reactor, a liquid-metal fast-breeder reactor 30 miles from Detroit. Olson also recounts the recent discovery of a shockingly high cancer incidence near the Summer reactor in South Carolina. Believing that nuclear power is a solution to global warming, Olson analogizes, is like an addict taking an “oil-addiction IV” out of one elbow and sticking a “nuclear-power-fantasy IV” into another elbow. Renewable energy technologies like solar and wind are far more cost-efficient and must be pursued to save the planet, Olson says. Like Dr. Caldicott, she strongly recommends everyone read Carbon-Free and Nuclear-Free: A Roadmap for U.S. Energy Policy (whose author Arjun Makhijani, Ph.D. has twice appeared on this program) which can be downloaded for free on-line. For more information, read Olson’s article Confronting a False Myth of Nuclear Power: Nuclear Power Expansion is Not a Remedy for Climate Change. Also read the NIRS reports Nuclear Power: No Solution to Climate Change and Out of Control - On Purpose: DOE’s Dispersal of Radioactive Waste into Landfills and Consumer Products. But hearing today’s program is a must! This entry was posted on Monday, March 16th, 2009 at 12:00 am	and is filed under Uncategorized. You can follow any responses to this entry through the RSS 2.0 feed. Both comments and pings are currently closed. I woke up early on April 2 . . . and listened to KPFK with the discussion with Mary Olsen and Helen Caldicott. It was very moving and should be required listening in every middle school science class. After the program I got up and googled “If You Love This Planet” and found the archive of the program and now plan to listen to the other programs as well. Thank you for this very clearly presented information. I am proud to say Henry Waxman is the Representative of where we live in California. OK That’s it. Keep up the wonderful work.